Born in the Twin Cities, Chainbreaker is more than just a bike event, it is an experience. Riders take part in activities throughout the year that culminate in a three-day celebration of cycling, entertainment, and volunteerism. Less than two weeks until ride weekend more than 900 riders have already committed to raising money for the University of Minnesota Masonic Cancer Center. With 100 percent of each rider-raised dollar directed to life-saving cancer research. Last year, the ride’s inaugural year, Chainbreaker riders raised $1.4 million for research to end cancer. 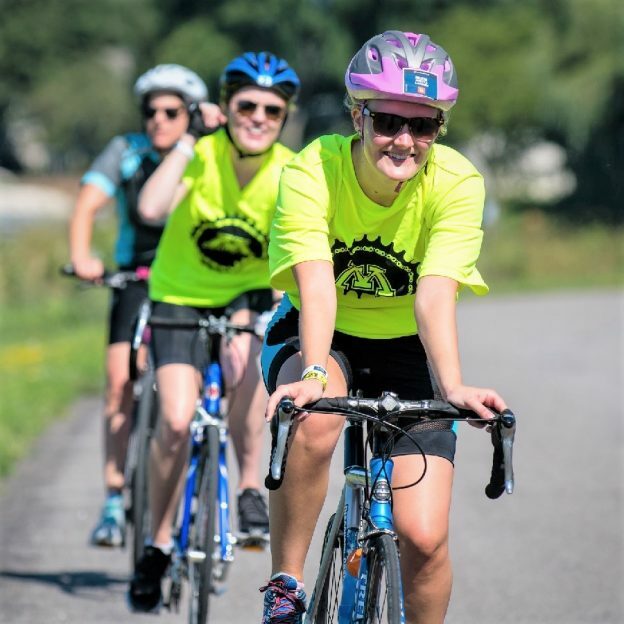 Like many Chainbreaker participants, Event Director Jennifer Waldron has a personal connection to cancer. Her son was diagnosed with Infant Acute Lymphoblastic Leukemia at just 10 weeks old. After years of ups and downs, her son Sam just graduated from high school and will head to the University of Nebraska this fall. At 17-years-old, he crossed the finish line as the youngest 180-mile rider last year. Will you join the riders this year and help end cancer cause? Registration for riders and volunteers is currently open at ChainbreakerRide.org. Registered riders may choose from four scenic ride distances of 25, 50, 100 or the 180-mile two-day ride. The bike routes have been designed to appeal to cyclists of all experience levels. Every Chainbreaker rider commits to a fundraising minimum that corresponds with his or her chosen ride distance. Two-day, 180-mile riders commit to $2,000, 100 milers to $1,500, 50 milers to $1,250, and 25 milers to $1,000. Riders have up until 60 days after the ride – October 12, 2018 – to meet their fundraising minimum. On the afternoon of Friday, August 10, Chainbreaker festivities begin with a celebration on the Blue Cross and Blue Shield Campus, located at 3400 Yankee Drive, Eagan, MN. Chainbreaker Opening Ceremony will include rider check-in and gift pick-up, a dinner buffet and beverages for riders and their guest, a short program, and live music performed by Ryan Kinder and local artist, Chris Hawkey. Riders also have the option to bring their bike for any last-minute maintenance. They can also leave their bikes in a secure parking area over night at the venue for their launch Saturday morning. On the morning of the ride participants of all four distances will saddle up at the Blue Cross Blue Shield Campus in Eagan and travel southeast toward Northfield, MN. Chainbreaker supports riders along the entire route with nutrition, hydration, and medical and mechanical assistance. Saturday’s rest stops will be located in or around Rosemount, Hampton, Lake Byllesby, Welch Village, Cannon Falls, and Dennison. The rest stops for the 180-mile riders on Sunday are in or around Lonsdale, Montgomery, Belle Plaine, and Cologne. Riders who register for the 25-mile ride will end their tour in Hampton, MN with a breakfast buffet and live music performed by The Nadas and Lewis Brice. Those who choose the 50-mile ride will finish in Welch Village with a lunch buffet, beverages, and live music by Levon and GB Leighton. Riders going the 100 mile and two-day 180-mile distances will finish their Saturday on the campus of St. Olaf College in Northfield. A dinner buffet, beverages, and live performances by Drew Parker, Hailey Whitters, and Jesse Larson conclude Saturday’s events. The two-day 180-mile riders overnight in the St. Olaf dorms, with a breakfast buffet Sunday morning and then finnish the Excelsior Commons on Lake Minnetonka. At the final celebration of the weekend, the 180-mile riders look back on a job well done with a lunch buffet, beverages, and music by Kalie Schorr and Cale Dodds. This year companies across the Twin Cities are joining in to support the cause with bikers, volunteers and sponsorship’s – They include 3M, Be The Match and D’Amico Catering to date. Chainbreaker isn’t just about the bike, it’s about our shared goal to end cancer. Sam was diagnosed with Infant Acute Lymphoblastic Leukemia. Infant Leukemia is very rare, and Sam was given a very poor prognosis. When I asked to speak to another mom that had gone through what we were going through, I was told that there were no moms that had the outcome I wanted to hear. As you can imagine, we were devastated. Sam was diagnosed and treated at Children’s Hospital in Minneapolis and less than 24 hours after he was diagnosed, he was put on a clinical trial with investigators from the University of Minnesota. Sam spent over 250 nights in the hospital and 2 ½ years being treated. There were numerous ups and downs in the process during and after treatment was completed. But, we have one of the good stories…Sam graduated from high school this year and is an incredible young man. He is headed to the University of Nebraska to follow in his parent’s footsteps of going to a BIG 10 university campus. After Sam was treated, my husband and I got involved in the Leukemia Lymphoma Society and began riding our bikes to raise money for cancer. I continued working as a speech pathologist and had two more children. Sam was thriving despite some difficulty with school because of the chemotherapy. Although we were past the crisis time, I wanted to have an impact on the problem of cancer. I decided to quit speech pathology and seek a new career path. That’s when I heard about this new “bike ride” coming to Minnesota where 100 percent of the money riders raised would go to cancer research at the University of Minnesota. It felt like the perfect match and I decided to get involved. I didn’t care what I did I just wanted to be part of the event and experience. I worked with Chainbreaker founder and cancer survivor, Tom Lennox, to launch our inaugural ride with more than 1000 riders raising $1.4 million dollars for cancer research at the Masonic Cancer Center, University of Minnesota. It was an empowering experience for all involved. For me, the highlight of the weekend was seeing my 17-year-old sweet Sam cross the 180-mile finish line triumphantly with his hands in the air and his dad right behind him! It summarizes his approach to life perfectly. He is not only a survivor, but he is living his best life. Sam motivates me to work every day to find riders who hate this disease and are willing to get on a bike, have a little fun, and raise some money to defeat this terrible disease! This entry was posted in News and tagged 3M, cancer fundraising, cancer research, D'Amicos Catering, Eagan MN, Event Director Jennifer Waldron, music by Kalie Schorr and Cale Dodds, Northfield MN, University of Minnesota Masonic Cancer Center on August 3, 2018 by Russ Lowthian.